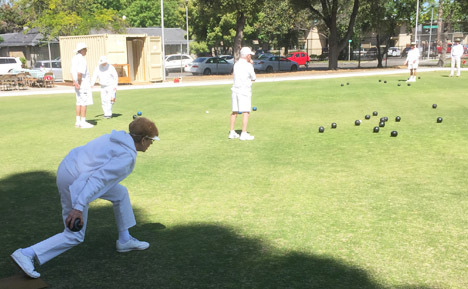 Fresno Lawn Bowls Club | It's like curling, without the ice. Oh we do like it when a great graphics designer like Tracy finally retires and can now spend a little time on our club’s marketing materials. Witness the new banner on our website pages, as well as this great new big postcard for us to share far and wide around the area. 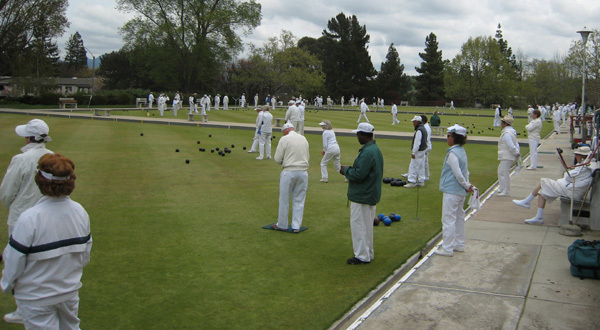 Needless to say, you are all invited to join with us and enjoy this gentle, social, outdoor sport, however old you are. Free lessons. Free loaner bowls. Friendly company and the occasional tournament too. Wow. 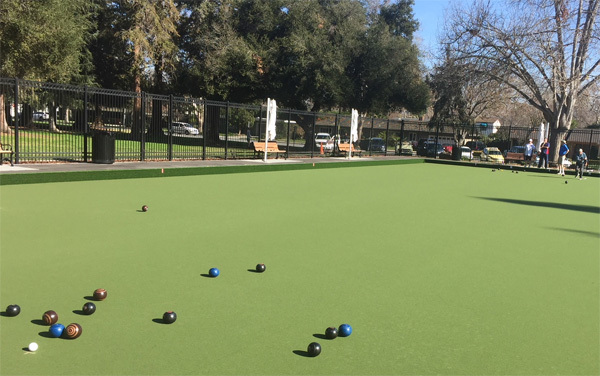 What an impressive facility City of San Jose has created for SJ Lawn Bowls Club. Not just a new world class green (which is too fast and set to Aussie and not US standards) but lovely fences, benches, umbrellas and surrounding gardens. Some of us will miss the old quirkiness of San Jose with its famous end lane that sloped off so badly, and think this is a new perfect tabletop. But it still has its minor subtleties you have to learn. I found forehands and backhands were not always the same draw for example. But there are very few visual clues so you have to use numbers and markers on the back boards (which are a longer artificial turf than the actual carpet mat). The carpet seams do show if you look carefully, but have very little effect on a rolling bowl. If we ever get Fresno to consider a no water, no maintenance green, then here is a great example, fully documented, of how to build a state of the art facility – for just a million dollars (all paid by city). But we sure will not let the Aussie carpet supplier dictate the green speed. 15.5 on the stimp meter might work down under (where they all have narrow bias bowls), but here it is way too much of a problem and greatly slows down the game as you wait and wait for your bowl to creep down as slow as you can release it. Plus you have to be more aware of players in neighboring rinks as you are probably going 2 feet out of your lane to handle the big loop needed to get back to the jack. But all in all, San Jose players are over the moon, even as they all rush to buy new bowls and have to learn all over again. 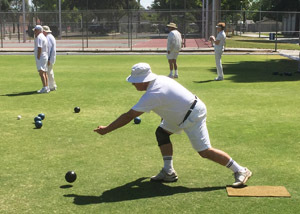 In this picture, taken on a very warm winter Saturday, look how far from the jack the bowls on average are here.. and this was a pretty experienced foursome. Kiss those tight heads goodbye for now.. and be stricter with Dales from Australia in the future. 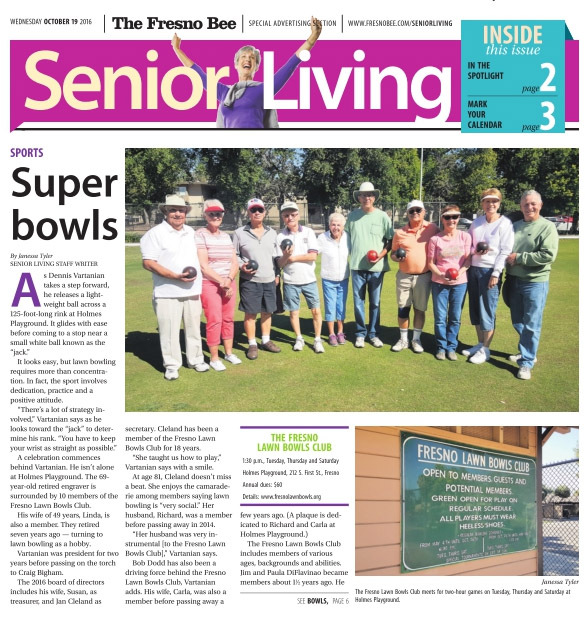 Yes, Fresno Lawn Bowls club is alive and well. Ade Perenon is our President for 2018 – thanks in advance Ade. Beginners always welcome at our club. 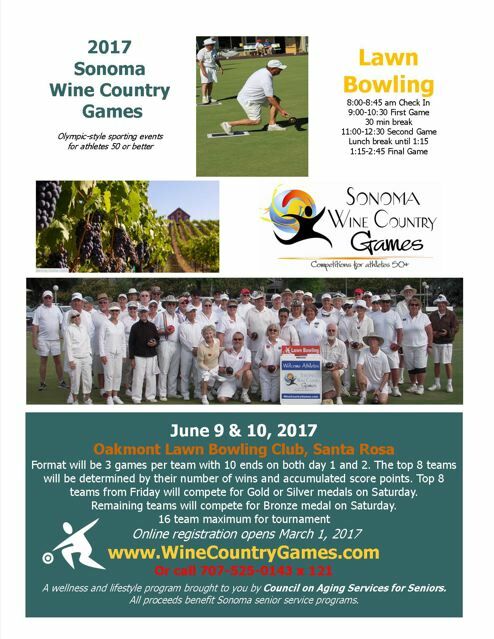 Plus we will travel and participate in a number of PIMD and other events, in addition to our annual home and away rivalries with Cambria. This year home weekend is April 21 and 22. And we will visit Cambria Sept 2 and 3. 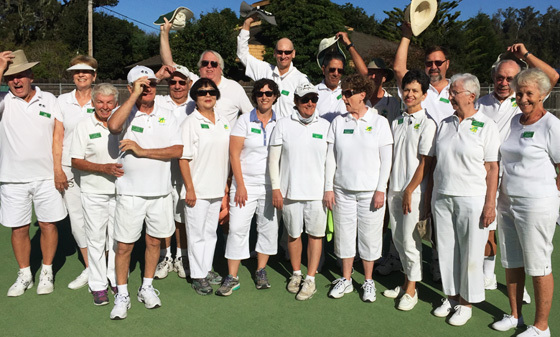 Meanwhile, why not join the very big tournament of the year, which is ideal for players of all levels – the Opening Day tournament at Rossmoor in Walnut Creek on their 3 lovely greens – Sat Mar 17th? Finally it stop ped raining and we had a great day on the greens. Thanks to all Cambria people who drove over to play against us, as well as all the local club food preparers and groundskeepers. 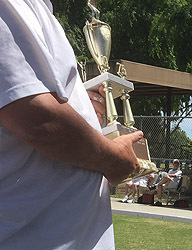 Craig is holding the trophy we reclaimed by winning 5 games to 3. Also by 76 to 69 points, so it was rather close. Pauline shows her fine form and long stride, while John and Dennis ponder the very short jacks in the background. The colorful Dutch from Cambria shows a different style. No stride for people used to playing on fast artificial turf. Ade shows great form – or did he drop it? Of course we want to send a team to Oakmont to play our old mentor and big time groundskeeper Bob Dodd up in the Napa Area. See notice below and let Craig or Dennis know if you are interested. 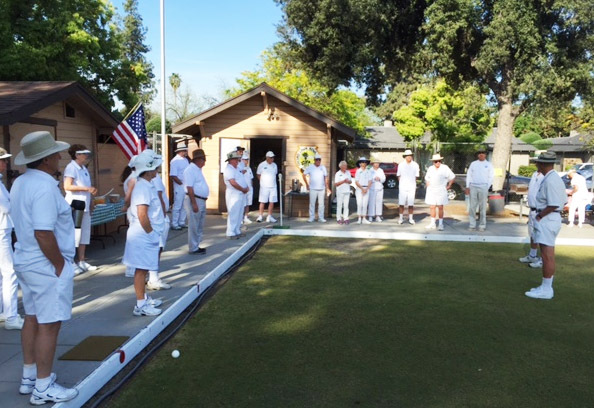 Some of us will definitely go to Opening Day on the Green (a fun, casual, very large tournament where beginners are welcome) on Rossmoor’s 3 greens as well as other events. While we await PIMD posting the final calendar for 2017, download an interim version here: PIMD 2017 Calendar. Plus we would like to organize a few of our own tournaments this year. At least a mixed doubles event (one man, one lady on each team) and a mixed triples tournament (at least one lady/ at least one man on each team). And how about a men’s singles tournament? Craig and Cyril (our 2017 Press and VP) are the people to discuss this with. What great coverage! More pictures coming soon courtesy also of the Fresno Bee. Newcomers always welcome. 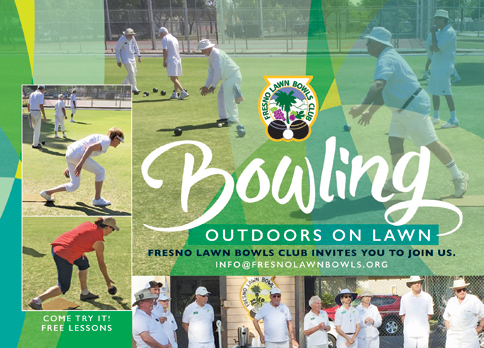 Free lessons and loaner bowls. Here is Link to Article. In lovely weather, and after lots of practice and a social game on Saturday, reality set in for the tournament Sunday. But it didn’t start that way. After the first round of games the score was tied. In fact, two of the six games had tied scores. Since we had quite a few extra players compared to our hosts, we then did some rotating of our teams and positions. Guess we brought on the “B” teams because then we got beat up badly on some games and lost most of the others. Oh well, that is why there is no trophy picture here. But do see the whole traveling team before the game, and Craig getting sincere advice from Dennis on Tracy on what to do with the bottle of wine he won in the pre-match spider. 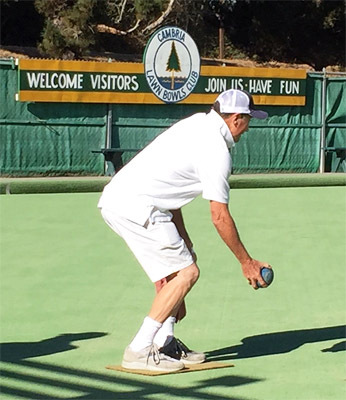 A Cambrian bowler shows us how to do it. Look how far right his feet are aiming prior to the shot! 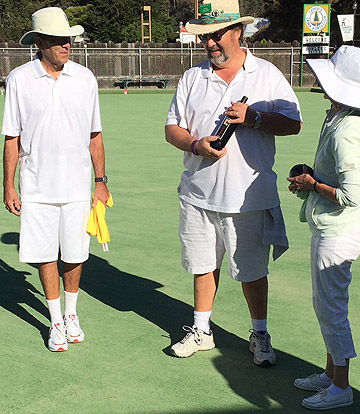 In a great spring day of bowling, Fresno won Sunday’s tournament in dominant fashion. 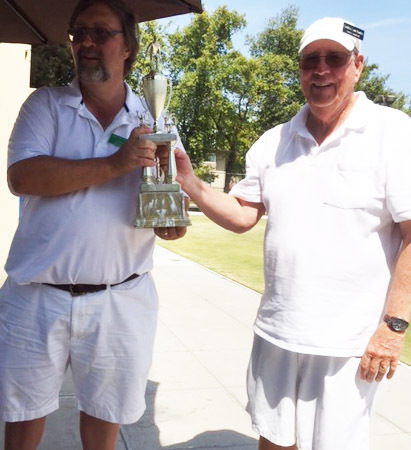 Here Craig Bigham receives the trophy back from Cambria to celebrate the fine event. Many thanks to the 14 or more Cambrians who made the journey inland. 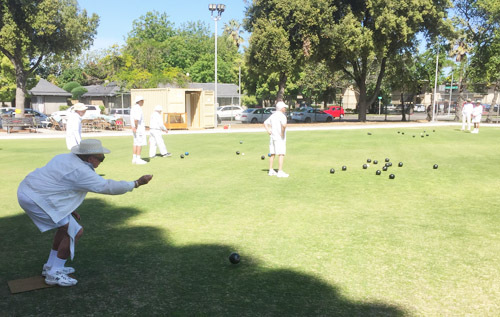 A spritely 80 year old named Bob Dodd, who has done wonders over the years for Fresno’s lawn bowling, is moving up to wine country so he can bowl and compete more often. Here he addresses both teams for the last time prior to the games Sunday. Now who will be our rule master going forward? All the best bowling Bob. The club thanks you deeply for all your service. Fresno is now proud to have Janice Bell as one of our members, even though she seldom can make it to town, and even though she also belongs part time to other No Cal clubs. No more for the Pacific NW, though it was on their team she helped win the gold in fours at the recent US Open. 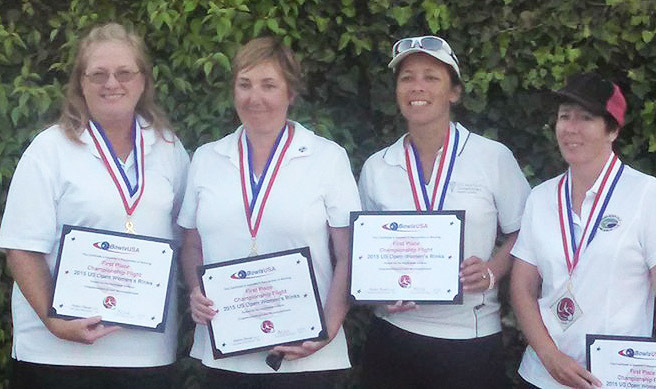 L-R: Kottia Spangler, SW, Janice Bell, NW, Anne Nunes, SW and Mary Ann Beath, Canada. Thanks to all who are helping Fresno transition into more of a competitive club. Usually we go to the coast to cool off, but this year Cambria was nearly as hot as our home base. And bowling wise, our lack of competitive tournament play really showed as we gave away a lot of points when holding the lead or good head positions. So the trophy stayed in Fresno for the rest of this year. It sure was nice to see Fresno’s new members competing though. The fact we can now put a team of 18 on the green on a road trip is fantastic.